Vista Start Menu 3.0 has been released. For those who may not know, it is a convenient alternative to the traditional Windows Start menu. Using your cognitive abilities to memorize locations and recognize images, Vista Start Menu is an effective solution both for beginners and advanced users. It enables you to access any necessary program folder or a file in one-two clicks, giving you an opportunity to work several times faster. Flexibility: Completely customizable Vista Start Menu lets you increase it to the necessary size depending on the number of programs you have. It saves you from the necessity to scroll the menu back and forth if you have a large number of programs installed. Moreover, since you have opened the Vista Start Menu, you don’t need the desktop and can use the whole screen for a quick access to programs from the menu. Power Buttons: A quick and easy way to shut down, restart your computer or switch the user using the keyboard or the mouse. Simply press the Windows key on the keyboard, and choose the button corresponding to the desired action. Large visible buttons, understandable images, detailed descriptions – all this make it easier and more convenient even for children and elderly people to work with Vista Start Menu rather than with OS Windows Vista. Flexibility : Being totally thought out, Vista Start Menu brings you an invaluable advantage of its flexible interface. It means that you can easily customize the menu according to your needs and preferences, which can not be fulfilled with a regular Windows menu. Starting Point : Vista Start Menu claims to be not only just a menu, but it is a starting point to access any programs or files at your computer. Add some of them, which you use more often, to the main menu or create one more tab for this purpose. Command Line : The Command Line integrated into Vista Start Menu allows you to search through the programs, Web or your computer by pressing the required keys. Vista Start Menu will search and offer you with the list of what it finds. Vista Start Menu includes a unique quick-launch method developed especially for power users. 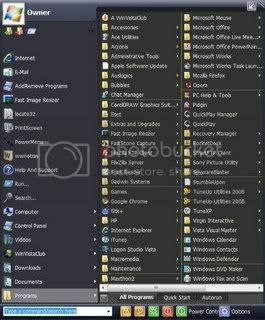 The uniqueness is that Vista Start Menu divides the list of programs into sections of 9 ones each, and each one is designated with the letter you have to press to highlight the section. Then press the digit which appears next to the program name. Therefore, you do not have to memorize any shortcuts or key combinations to start a program. Just follow the tips. From other side, as the programs do not change their positions, eventually you remember the frequently used combinations and launch programs instantly due to gained reflexes. Convenient Place : Move Vista Start Menu to any convenient place on the screen or to another monitor. The program automatically adjusts the window size as for the monitor. Power Buttons : This is one useful feature. To view the Power Control window, simply make a double click on the bottom panel. To make power buttons visible in the start menu, just make right-click and select the Power Buttons which you want to be visible. To hide the unnecessary buttons, unselect them. The timer integrated into Vista Start Menu is one more reason to feel its developers proud. If you can not wait until a file is downloaded, just forget about it and do whatever you need. Vista Start Menu will turn off your computer itself at the very time which you set. Skins: Vista Start Menu looks and feels like home on every platform. Whether you get used to Windows XP or Windows Vista, you can change the look of your Start menu according to your tastes. VistaStartMenu is freeware, but it has a Paid PRO Version which has some features like : Single-Click Launch, Quick Uninstall, Menu Tabs, etc. The only thing you may find disconcerting in this program is its large Window size which hides the Desktop. Worth a check-out ! HomePage. We are delighted to give you the license of the VistaStartMenu PRO Version for being an active member with the maximim number of posts ie 162. So you get it. Please check up your PM Inbox for the code and the download link of the paid PRO version. This comes to you courtesy the Developer of VistaStartMenu. If anyone wants to purchase it, the company has been good enough to make it available at a special discount of 30&#37; to the WinVistaClub readers. Click here. Those interested can also check out its freeware version. Nice software and congratulations tweakwindows. :P Quite a generous heart Anand, eh? Nice nice. Keeps me coming here. WVC is rocking in all the ways......lots of Giveaways in last of December 2008. Agree, it makes me dizzy.